"The doors, tracks and openers were installed in a few hours. 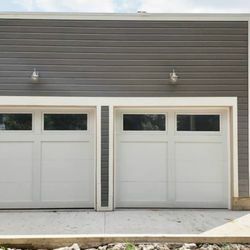 They look great and add so much to our exterior as well as quiet and warmer in the garage. The technicians tweaked the pad installation as we needed. They were on time, professional and courteous. I give them 5 stars. My only ding on performance was filling up our rolling recycle bin with intact noses that we had to pull out and break down. I thought the boxes would have been hauled away."